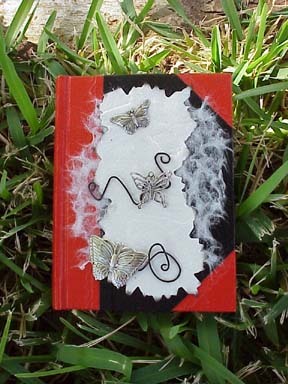 Art Collage book made for Elizabeth Ann Scarborough, Prodigy Secret Pal Swap 2001. 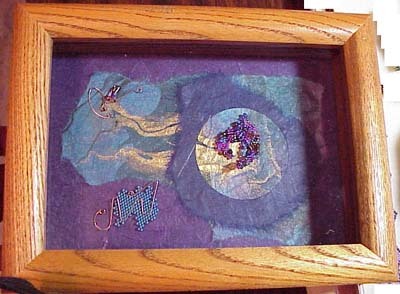 Cork book cover, 2-needle applique quill pen (size 13 charlottes), handmade paper, wire, beads, geode slice, leather. NOT FOR SALE. Collection - Elizabeth Ann Scarborough. This is one of my personal journals. The text-art is part of some fiction I am writing. 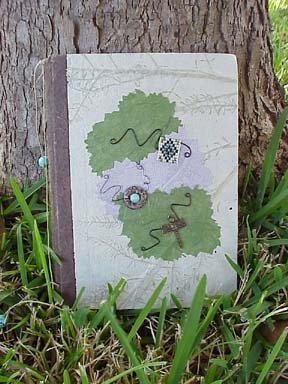 Handmade book and papers, rubber stamps, embossing, beaded bookmark (glass beads on hemp). NOT FOR SALE. Collection - the Artist. 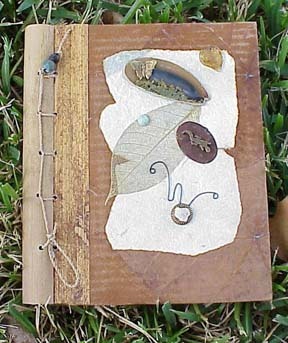 Blank journal - unlined pages of handmade paper (deckle edges), with bookmark, gemstones (turquoise, jasper donut), wire, handmade papers, brass charm, glass beads (loomwork piece), hemp, natural materials. Signed and numbered. 6 inches x 8.5 inches. 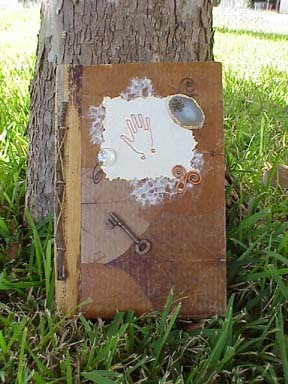 Blank journal - unlined pages of handmade paper (straight edges), copper wire, glass, brass charm, old key, geode slice, handmade papers, natural materials. The backdrop of the cover embellishments are real leaves. 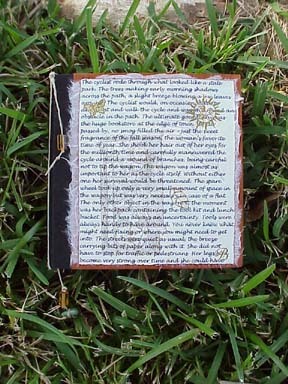 Twig and bark binding. About one inch thick. Signed and numbered. 8 inches x 12 inches. 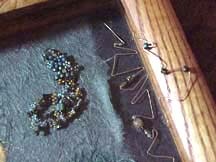 Blank journal, wire, brass charms, handmade papers. Lined pages. Signed and numbered. 3.25 inches x 4.25 inches. 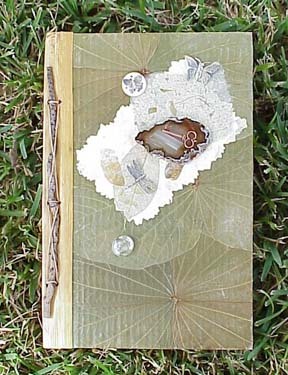 Blank journal - unlined pages of handmade paper, copper wire, glass, brass charms, geode slice, handmade papers, natural materials. Real leaves are the background for the cover embellishments. Bark and twig binding. Bone medallion with butterfly charm. Copper-colored key charm sits on the geode slice (which contains some copper color - very pretty stone). A dragonfly adorns the gold-vein leaf and a moth sits in the upper corner. Glass simulates water droplet. Signed and numbered. 8 inches x 12 inches. 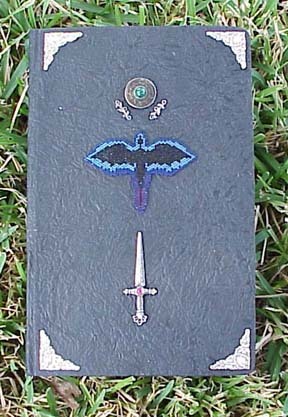 Blank journal - unlined pages of handmade paper (deckle edges), thick-textured covering, gemstone (malacite), glass beads (dragon medallion), brass charms, pewter. Black is very difficult to photograph and so this picture is lightened so you can see the embellishments. The cover textured surface is a lovely, rich black. 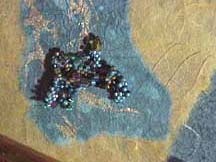 The dragon medallion is my design worked in peyote stitch with Delica beads. The "shield" above the dragon has malachite in the center. The sword is pewter. Guys really like this one! Signed and numbered. 1.75 inches deep. 6.5 inches x 10 inches. 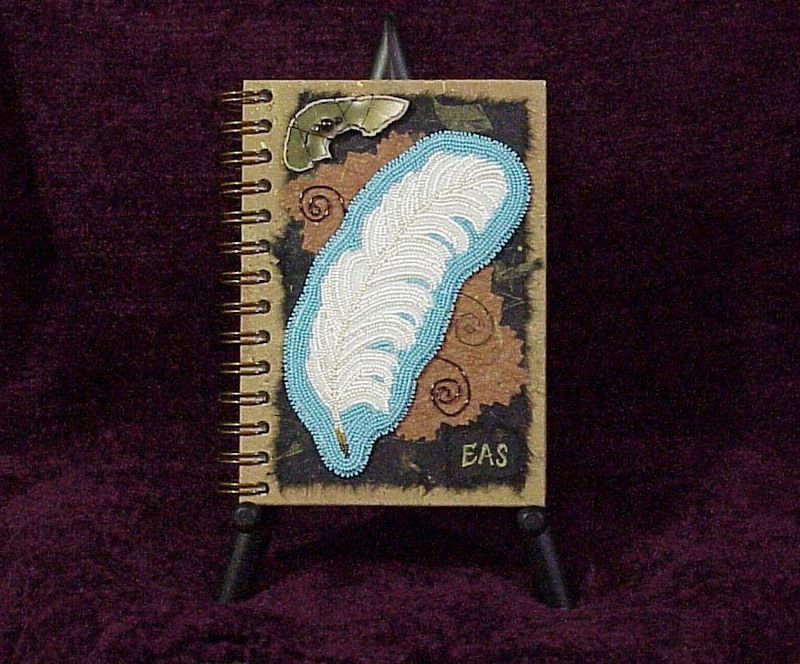 Blank journal - unlined pages of handmade paper, wire, brass charms, handmade papers, gemstones (turquoise, quartz), glass beads, geode slice, tin, natural materials. The background of the covers are real leaves. Bark and bamboo binding. A lizard sits on a 'rusty' oval which overlaps the gold vein leaf which sits under the geode slice occupied by a butterfly. Whew! Signed and numbered. 6.75 inches x 8 inches. 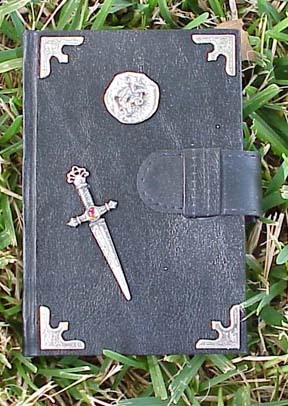 Blank journal - unlined pages, ribbon bookmark, vinyl self-closure band and pen holder loop, brass charms, pewter. Again, black is very difficult to photograph and I have lightened the picture so the embellishments can be seen more easily. The sword is pewter. The 'shield' medallion has a dragon with raised wings attached to the center (kind of looks like a crest). Guys really like this one, too! Signed and numbered. 1 inch thick. 4 inches x 6 inches. 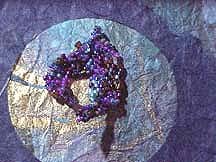 Freeform Beadwork pieces are enhanced by handmade papers, wire and other found objects framed in a shadow box. (Please note: difficult to photograph under glass!) 7 inches x 5 inches. Signed and numbered. First in a series. Click on the left photo for a larger view. Hit the back button in your browser to return here. 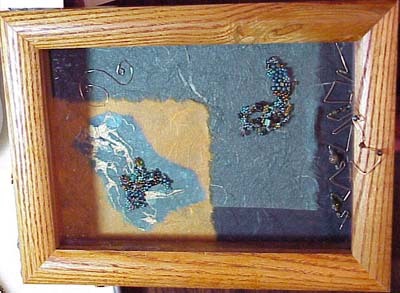 Freeform Beadwork pieces are enhanced by handmade papers, wire and other found objects framed in a shadow box. (Please note: difficult to photograph under glass!) 7 inches x 5 inches. Signed and numbered. Second in a series. FOR SALE.